By the time this review appears here in the Buzz Words’ blog, the story told in this book for readers aged 9 to 12 years, will have been seen by thousands of Australians in cinemas where it has screened as a major motion picture. At the age of five, Saroo Brierley became lost on a train in India. Unable to escape the carriage he travelled in alone, he spent many hours until he arrived in a foreign city where he had to survive on his wits. After numerous adventures he was taken to an orphanage in Calcutta from which he was adopted by the Brierly family in Tasmania Australia. Despite being happy in his new home, Saroo kept memories of his mother, sister and two brothers but he could never remember the name of his home town. He spent hours staring at a map of India in his room and when he was an adult, working in his adoptive father’s business and with an Australian girl-friend, he began to pore over satellite images on Google Earth seeking out landmarks he remembered. 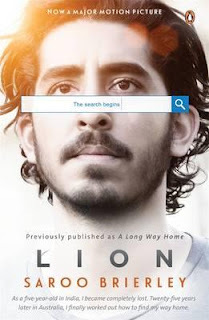 By looking at train tracks leading into Calcutta, Saroo was able to restrict his search zone to ‘only’ 962,300 square kilometres – over a quarter on India’s landmass, in which lived 345 million people. How on earth could he be expected to rely on his memory at the age of five and yet find four family members nearly 25 years later? The incredible thing is that Saroo succeeded by eventually being able to locate childhood sights of an overpass, a bridge over a river and a train station! This is a fascinating book because Saroo’s life story is fascinating – and certainly inspirational, showing readers how it is possible to achieve success through relentless perseverance. Saroo is reunited with his mother, brother and sister. He learns that the night that he disappeared, so too did his teenage brother Guddu (who he was to find out had been killed). On seeing him, his Indian mother called out ‘Sheru’ – even his first name was mispronounced differently! This is a simply told story of winning against immeasurable odds and is sure to be enjoyed immensely by keen readers.